Winter got you down? Craving the warmth of spring days? Feel down no more and hop on that bike. 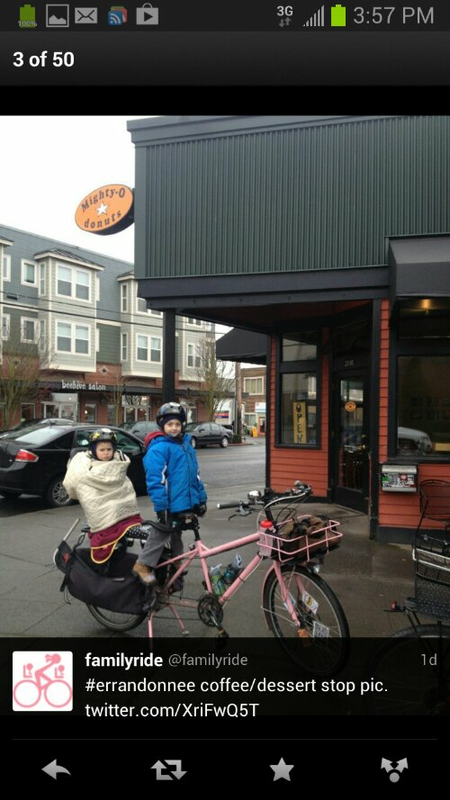 It’s time for a March challenge designed for the utility cyclist with lots of errands to do, even in winter– the Errandonnee! *Technically, this is 13 days, but I encountered some issues with math along the way. And with the weather this year, I’m building in a snow day. Conceptually, these two words may not initially fit well together, but string 12 errands together for one long ride interrupted by sleep and other diversions, and you have… an errandonnee. Technically, I suppose there should be an accent above one of those last e’s, but it’s too much work to find that character on my computer. Complete 12 errands from Friday, March 7 through Wednesday, March 19, 2014. Complete the Errandonnee Control Card as you go. There is no maximum number of errands you must complete each day, provided you complete all 12 by the end of Wednesday, March 19. You can ride all 12 errands in one day, do one errand per day, or any other combination that works for you. The Wild Card errand is for any trip you make that does not fall into any of the categories listed on the control card and you somehow cannot figure out how to fit into the Personal Care category. It is suggested that you complete two errands after dark (or before daylight), but this is not a requirement. Please note the lighting method used. If the Errandonnee stresses you out or offends you or makes you feel bad or sad or competitive, you should stop. This is supposed to be fun and if you are not having fun then please do not continue because feeling stressed out or offended or bad or sad or competitive due to the Errandonnee is not what this is all about (that’s what family is for, KIDDING!) and it’s no way to live. Deadline for Errandonnee submissions is midnight in your area, March 25, 2014. Send all qualifying rides together. That is, send me all 12 in one go, NOT ride 1, ride 2, etc. If you have been blogging or tweeting your errands, you can send me the links to those as well as the completed control card. 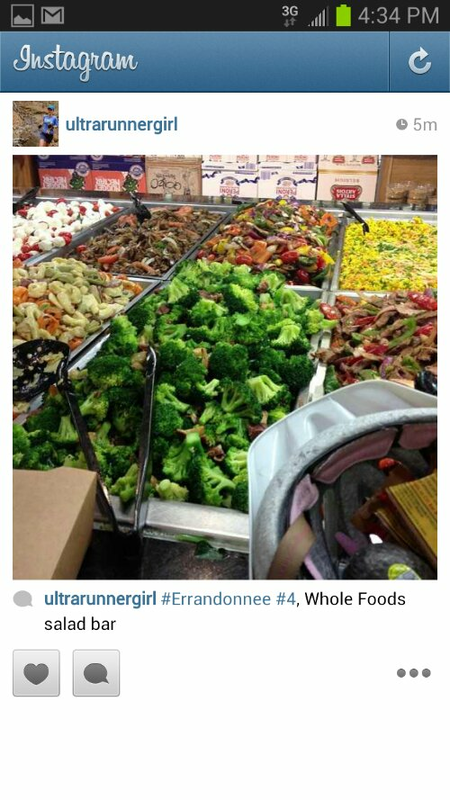 Everyone who successfully completes the Errandonnee will receive a prize. But, as in coffeeneuring, it is not a mountain of money so don’t quit your day job. Please include a snail mail address in your submission so that I may send your Errandonnee swag to you. 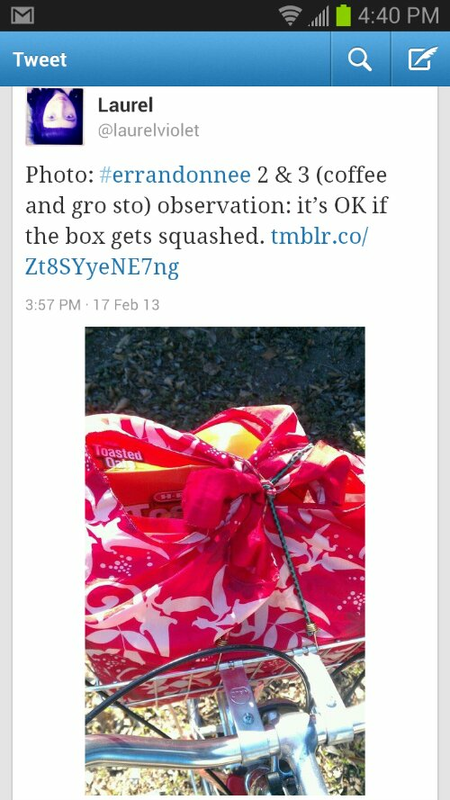 Also, please feel free to tweet as you go using the hashtag #errandonnee. Two r’s, two n’s, two e’s. If you have a blog and errandeur, please send me a link to your write-ups! I have an additional Q&A post here. If that still doesn’t address your question, ask in the comments of this post or send me an email if you’re shy. 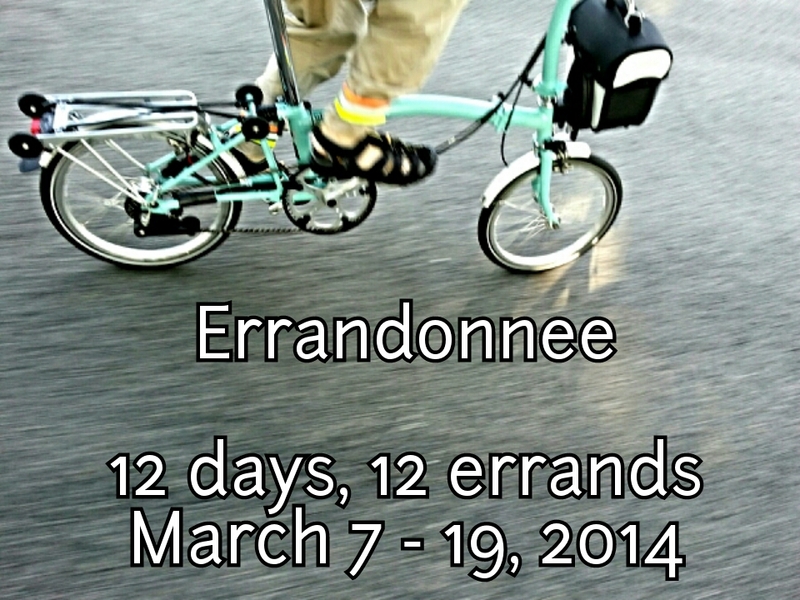 The Errandonnee: March 7-19, 2014. Winter’s last gasp (fingers crossed). Let’s do this. I’ve been waiting for this!!! Okay, MG, now you’ve done it. You’ve inspired me to try it again this year. I would never have accomplished it in February this year, but I’m banking on warmer temps in March – at least it’s supposed to be near 30F by this Friday. It should also have the added benefit of getting me in shape for the start of spring(?) commuting to work. My March Break falls right smack bang in the beginning of this. I had planned on spending most of that time in my jammies, but you have inspired me to get dressed occasionally. Like, at least one day. I am in with a big Friday start planned. My only question is, pronunciation, when I tell friends what I am doing. Excellent! I have always pronounced it Er-RAND-onnee, but given that it is a made up word I think the first pronunciation is perfectly fine, too! Ooh I was hoping I hadn’t missed this!! Unfortunately I read this yesterday, right after I got home from: the bike shop, the grocery, the library (where I met a librarian-randonneur! ), the bank (wild card), work, did a community meeting last night and went to another bike shop… Can’t wait to do it all again though!! It’s on!! Pingback: The Errandonnee: It Starts Today! | chasing mailboxes d.c.
Great! And by the way, your comment did not post twice, although you did make me laugh when I read it. I am SO taking part this year! Last one of these I’ll be able to participate in before I retire to the hinterlands of Vermont! Question: can we submit a Strava map image in lieu of a ride photo? I believe you’d accepted mine last year, but wanted to double-check. Yes, you can submit a Strava link, although a photo is preferred. Thanks Mary. Follow-up question: will a bookstore work in lieu of library (if we go for “reading research”), or does that fall under “any store other than grocery store”? Yes, you can still count it, provided you documented it. Seconding Adam’s follow-up question, because in the Library category, the phrase, “also includes book reading” confuses me — does that mean that riding somewhere to read a book that I already have, could go under the Library heading? Next question: Could visiting a friend who’s going through, let’s say, a very tough time, count as “Community Meeting”? Because it’s a lot closer to a religious service or a teacher conference than it is to a HappyFunTime hangout. Or is the point of that category that more than two people are involved in whatever the event is (and that the purpose of the event is “bigger than”, or “outside”, those two people)? Vance and Froggie: Library and book reading. 1. A book store cannot count as library, but as noted, as store that is not the grocery store. 2. “Book reading” was conceptualized as being a person going and listening to an author read his or her book. However, I had not considered this liberal interpretation of riding somewhere to read a book one already owns. I will count it as a “Library Without Walls” library. Vance, for your second question I don’t think it would count under Community Meeting. That is intended to be, as you suggest, larger than two people. However, you could count it as a Wild Card, OR if you visited and had lunch or breakfast or something, you could count it in the Breakfast or Lunch category. One question, though. Could riding to school count in the Work category, or is it more of a Wild Card? Are you a student? If so it counts as work. I meant to update that for this year. Thanks for the question. Thanks for putting this challenge out there. More often than not, I drive on most of my errands. Even the ones nearby. This should be just what I need to help motivate myself to take my bike instead. Already have bike shop, gym, commute, and wild card trips down. Montana will be represented! Pingback: Errandonnee: Q&A Updates | chasing mailboxes d.c.
Two questions: Suppose one is retired, so is not riding to work? What might substitute for that? 1. If retired, then volunteering can count as work. Or, if one is retired and taking a class somewhere, then that can also count as work. 2. Knitting group can definitely count as a community meeting! Pingback: Errandonnee Roundup! | chasing mailboxes d.c.
First time visiting. So could have participated if I had heard sooner. 😦 Next year?